August | 2014 | sausageheavenoutdoors Enjoy making homemade sausage, Tasty way's to BBQ, smoking meats and poultry. See how northern Minnesota was settled and the life early homesteader's lived their lives and more!! The Minnesota DNR will auction confiscated hunting equipment on Sat. Sept. 20, beginning at 10 am. The auction’s items are from people who forfeited their equipment after committing serious game violations. The auction is open to the public. It will be held at Hiller Auction Service, 10785 261st Ave., Zimmerman. Sale items include confiscated firearms and bows. A list of firarms and bows for sale is on the auction website at; http://www.hillerauction.com/apr28.html. Inspection of items is Friday, Sept. 19, from 8 a.m.to 5 p.m, and at 8 am, the day of the auction. Once the auction begins, there will not be any access to the firearms. All equipment is sold as is, including all defects or faults, known or unknown. Items cannot be returned once they have been purchased. Buyers may bring their own cases or there will be cases available for purchase to transport firearms. Anyone buying a firearm must pass a background check. Proceeds from the auction will be deposited in the state’s Game and Fish Fund, the fiscal foundation for much of Minnesota’s core fish and wildlife management functions. I know I mentioned this before, but it don’t hurt to mention it one more time. Those who want to harvest antlerless deer throughout much of Minnesota this hunting season must apply by Thursday, Sept. 4, the Minnesota DNR said. Antlerless deer permits are issued by lottery. Many deer hunting permit areas that have not been in the lottery classification in recent years are in that classification this year. Deer hunters should review the hunting and trapping regulation book to see if their hunt requires entering a lottery to harvest antlerless deer. Hunters who want to participate in special firearm deer hunts need to apply for permits that are issued by lottery; the application deadline is Sept. 4. More information on deer permit areas and special hunts in the DNR hunting regulations handbook, at http://www.mndnr.gov/hunting/deer. Wolf licenses are also issued by lottery. Wolf hunters and trappers must apply by Sept. 4. Information on wolf hunting is available on the DNR website at http://www.mndnr.gov/hunting/wolf. Wolf management information is available at http://www.mndnr.gov/wolves. The eyes and gills were still intact, leading Perron to believe the fish hadn’t been dead long. ” The teeth were ground all the way down,” said Perron. “And some of the skin was a bit flabby. It likely died of old age.” The former conservation officer and Navy man had to make a decision as to what to do with the muskie. The former conservation officer and Navy man had to make a decision as to what to do with the muskie. “For being in that lake that long, not being caught, it deserved to be back out there,” said Perron, who said he blew his boat’s horn and saluted the fish as it floated away from his boat. A Proper burial. The fish of a lifetime-Perron said at one time it was no doubt a state record- had a head on it nine inches across. After seeing the monster, Perron believes there’s likely another one just like it- alive and swimming in Mille Lacs–because of the amount of forage and the sheer size of the lake and areas which aren’t fished. So, for now, the state record muskie still stands at 54 pounds. 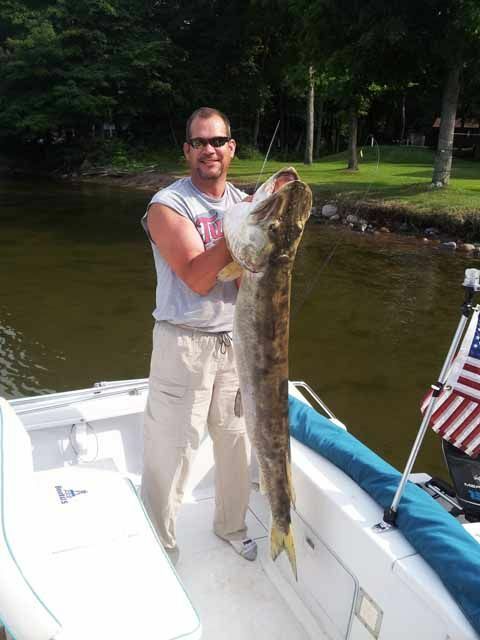 That fish was 56 inches in length and had a 27.25 inch girth. It was caught on Lake Winnebigoshish in 1957.